Jungle Red Writers: Travels with Charley or staying home with Charley? Travels with Charley or staying home with Charley? ROSEMARY: This year marks the fiftieth anniversay of John Steinbeck's Travels With Charley. 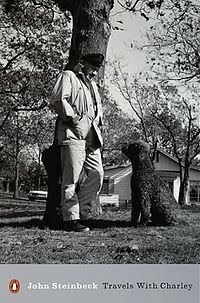 Fifty years ago Steinbeck embarked on a road trip with his standard poodle, Charley and set off to see America, perhaps for the last time. I remembered loving the book when I was young and reread it five or six years back, just before I embarked on my own road trip with doggie. My pooch was a golden named Patrick and I was convinced the only way I'd ever finish my first book was to load up the car and take off, just the two of us. I drove a Jeep, not a refitted "Rocinante" and I schlepped a computer and a printer (six years ago printers were big!) My plan was to visit famous gardens on the east coast and derive inspiration from them, as well as from Steinbeck. Despite the fact that I had to change my route numerous times(the DC sniper was targeting people at gas stations)I had an amazing trip and did manage to finish the book. More recently I sequestered myself in my NY apartment to put the finishing touches on book four. It worked. I can't say I ate healthy, exercised or was very sociable but it was total immersion and I loved it. And i felt great when it was over! Do you have any rituals or favorite ways to get yourself across the finish line when you're finishing a book? First time visitor to your site. It amazes me how Steinbeck conjures immediate memories. I remember being indifferent to "Travels" when i was 14 years old and loving it when I read it two years later. I'm trying to create a blog now for my writing. I can only hope mine has the good karma I have found on your site. Hey, Douglas! Welcome! ANd hope you're a frequent visitor. Ah, Ro, you are such an adventurer. I'm always in awe. Finishing. You know my plan? Charts. I keep track. I make goals, and then try to meet them. And then write down my progress. Reachable goals, word counts I can do. Then when I make the count, I feel so virtuous, and so...empowered. Ah, how we fool ourselves. But whatever works, huh? And look how nicely your travels worked out, RO! When I have to finish a manuscript, I clear the decks. I ignore everything else in the world and go into some adrenaline overdrive that I suspect is the addiction that keeps me writing. I can't believe it has been fifty years. John Steinbeck was my favorite. Kaye George and I were just talking about how when we were kids there wasn't a "YA" market. We read the classics, or what we considered classics, like Steinbeck. I remember reading "East of Eden" under the covers with a flashlight because I couldn't put the book down. My parents had no idea! His wisdom and insight shaped me during my formative years. At least I hope so. I'd love to take a writing break. No work, no dogs, no hubby, just me and the laptop. Maybe one weekend. Doug? I love your desk. I loved my Travels with Patrick. It's great to let the dog's rhythms and needs set the schedule for the day instead of your own. And talking to the dog is a good way to try out dialogue! I also confess to being one of those Thelm and louise type packers (on car trips.) Everything gets thrown in the truck. I didn't pay any attention to word count when I wrote my first two books. Now, I use it as a weekly - not daily - goal. Daily would drive me nuts. Panic? And I have a stubborn insistence on meeting deadlines. The downside of that is that the manuscript may not be perfectly polished--but when is it ever? I trust my editor to find the story buried in the rubble. I harbor a fantasy of spending a month in a cottage in Ireland, just me and my laptop. And Wifi (did you know that there are entire towns in Ireland with free Wifi?). Sheila...I KNOW the cottage. It's in Achill. How about if you take a cottage at one end of town and I take another and we meet for drinks at the pub after we meet our word counts? Ah, "Travels with Charlie"... I loved Lawrence Block's sly reference to it in his Keller (a hit man) book "Hit Parade." Keller, who detests people and animals alike, buys a stuffed dog an puts him on the passenger seat so he has someone to talk to on his long drive to wherever it was he was going. Cracked me up. But seriously... I'm like Hank. Goals. Charts. Word counts. Just DO it. Inspiration schminspiration. Hi all. Thank you for this blog and for all great books (and inspiration) you ladies provide! I've made a pact with myself... Even if I know how a piece will end, I try to make myself "earn" the writing of that final chapter-scene-paragraph-sentence. Therefore, when the finish line finally creeps into my line of vision, the need to figure out if it's real or a mirage becomes motivation in (and of) itself to keep my derriere glued to the chair and find out. I'm like Hank and Jan. I set deadlines and expect to meet them, but when I get close to the end, I like to get ahead, so I go into an adrenaline overdrive. I'm not sleeping. I'm excited to move forward. It's fun, exciting, a challenge. And then I need a breather. And hugs. I have to announce that I finished a book yesterday. I knew I was near the end so I just sat there until I finished it. Of course there will be some polishing. I thought of a couple of things I need to add while driving an hour to a bookstore last night but at least my heroine is back home and still alive--a good achievement. My tip on finishing is not to worry too much about the very end of the book until you've had a chance to read through the whole manuscript. Then you get a clearer vision of what needs to happen to tie up loose ends. Yay, Rhys! Can't wait to read it..